After a visit with the allergist, my whole view on medicine and doctors changed. I didn't know what to believe, where to turn, what to think. My stupid hives that covered my body, once believed to be that of stress or food, became so much more as he began to go on about how I needed to see a blood doctor (hematologist) due to some abnormal blood work. This same doctor had mentioned about an under-active thyroid, but after further tests that has been dismissed. So I did have some doubt heading into my appointment today. I was semi prepared to see the 'C' word around me at some point, as the allergist had mentioned the 'C' word before. I was mad at him for mentioning the 'C' word because no one likes that word and it seemed unnecessary, at least until he had some facts. I didn't realize that going to this appointment today I would be surrounded by the 'C' word, in fact the building I went into had the word in it, the posters, the booklets, the signs... it was everywhere. I could feel myself getting sick. My head was burning and tears were welling up in my eyes. I was only there to see the hematologist, yet it seemed like I had something worse... and I hate saying worse because I know that real people deal with the 'C' word everyday and I hope to them, something is worse than the 'C' word, because no one wants the ultimate worst thing... For instance, having diabetes, to cheer myself up I think of what is worse, what could have happened, what I could have had instead... and to be honest my worst was being flashed in front of me. I walked around the hospital like a chicken without his head, until I found a seat by a fish tank. It seemed calming and I was trying not to look like an idiot and start crying as I was surrounded by those that actually had the 'C' word. I was given a booklet about the 'C' word and ultimately became confused as if I had instantly progressed upon arrival. But no, she let me know, "we give everyone this booklet..." interesting. I saw a nurse who was super excited, turns out it was his 51st birthday, so I get that, meanwhile I am trying to keep calm as he asks about any history of 'C' in my family or any history of blood disorders, when I responded with 'not that I know of' to the latter, he said, "so it's just you with little blood disorder." Little Blood Disorder? Little? Blood? Disorder? I was now full on confused how was my state changing with each chair I sat on. I learned something valuable today. As I don't know my healths state right now. I know that there were lots of people there fighting hard. I saw tears, I saw flowery bandanas covering woman's heads that were bare, and I witnessed a bell ring, people get up and clap and a woman jumping for joy (I am assuming she's 'C' word free or did her last round of Chemo, because yes that clinic was beside mine). I walked out being positive but keeping a piece of my heart (and skin literally) in that clinic because for a moment I realized that what I thought was 'worse' isn't just a thought, it happens, it happens to the young and old, there are people every day going through the struggle that I just imagined as 'worse'. I saw life and I saw hope, I saw sadness and fear...I saw more than I imagined I would see and felt more than I ever knew I could feel. We need cures, we need hope and we need compassion for those living with what's 'worse'. Hey Kayla, I can really truly understand what you're feeling. 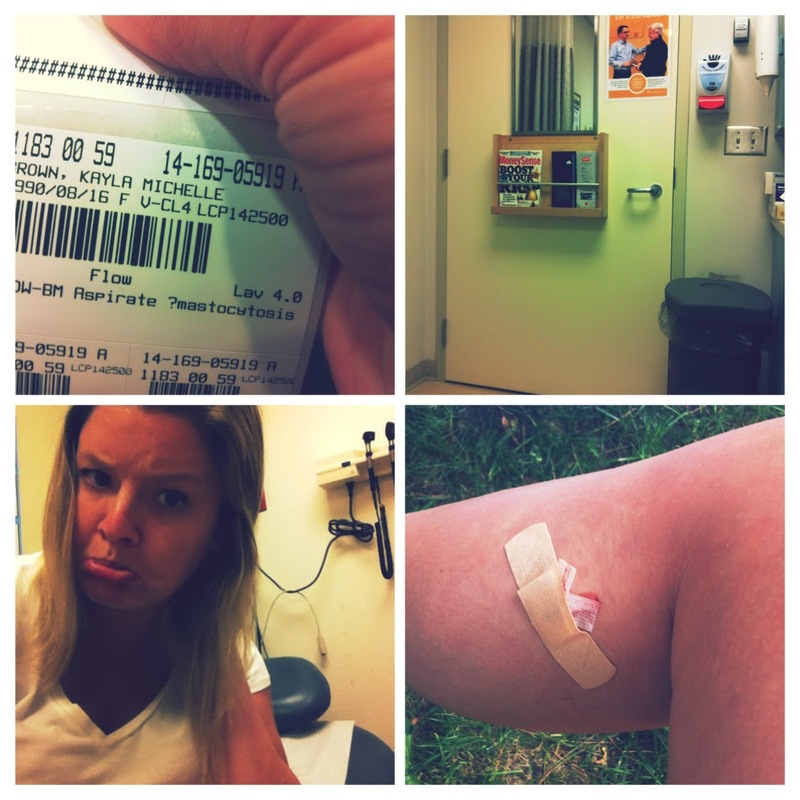 Last month I went into the hospital to have a hysterectomy. The surgeon was unable to do it because I have whats called pseudomyxoma. This type of cancer is a cancer of the appendix and it basically attacks the ovaries and it makes it looks like the ovaries have a tumor. My belly is full of this slime. My daughter says I have a snotty appendix. So I had no idea I had cancer when I went into my first surgery. I've seen the doctor who will remove my appendix and all the slime in my belly. I am lucky in that this cancer is very VERY treatable. Yes it is scary. It is strange that I didn't know I had it. I had goofy symptoms but nobody though oh you have pseudomyxoma. They caught mine early, so that's why it's treatable. With this type of cancer, last year there were only 1,300 cases in the entire US! I would think whatever you had, they have caught it in the early stages and they can take care of it. You're a strong woman Kayla and can survive! Just fine a new word for it like my daughter calling mine a snotty appendix!!! A lot easier to stomach. is this related to your Eosinophil count ? are they questioning if you have mastocytosis ?